Coming Soon From Sarah Madison! I have to snort a bit at the title of this post–it feels as though I should run a movie trailer, doesn’t it? But there are a lot of things going on right now that I’m very excited about! Next month (32 days by the website’s counter! ), I’ll be attending Galacticon 3 for the 35th anniversary of Battlestar Galactica! I’m a BSG fan from way back, and I was delighted to be invited to attend this convention as part of a panel discussion on fanfiction, as well as helping to host a workshop on writing fanfiction (or really, writing sci-fi in general). Imagine my glee when I found out that ComicPalooza was being held at the same time! Or when I discovered that Galaction is a HUGE event! I’ve been to sci-fi conventions before, but never one of this magnitude. I’m thrilled, and just a little nervous too. BSG Scriptwriter Terrance McDonnell is also going to be on the panel, and I’m not sure I won’t be tongue-tied as a result! What do you think? Should I bring my Peggy Carter costume? I confess, I am looking for an excuse to wear it again. First, there are the shoes. C’mon, these are rocking shoes, aren’t they? 🙂 Then there is the time and effort I put into putting the costume together in the first place. I’m still having trouble with the skirt though. The one I got originally was too long, but when I had it hemmed, I didn’t take into account how short the jacket was that went with it, and I ended up with a gap at the waist. I’ve got another skirt now that fits beautifully, but is too dark. I’m not sure I can match the color to the jacket by May 23rd! But then there are the extras that go with it! 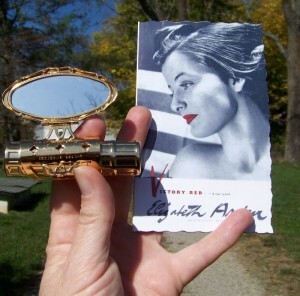 A dear friend of mine found the exact shade of red lipstick I’d been searching for: Victory Red by Elizabeth Arden–the favorite shade of women in WW2 and still manufactured today! You should have heard me squeal when I got my surprise package in the mail. Not only did it contain the right lipstick, but my friend went the extra mile,providing me with props as well! I guess it’s pretty obvious I have a interest in WW2 history. The clothing of the period fascinates me as well. I loved the Captain America movie, and I adore Peggy Carter. I think one of the reasons I love her as a character is that she never lost sight of her femininity, and yet she was as tough as nails. Truly a heroine I can look up to and admire. So you can imagine my reaction when, along with the lipstick, I discovered an era-authentic compact by Stratton, which my friend assured me was what all the women used in Britain during the war. 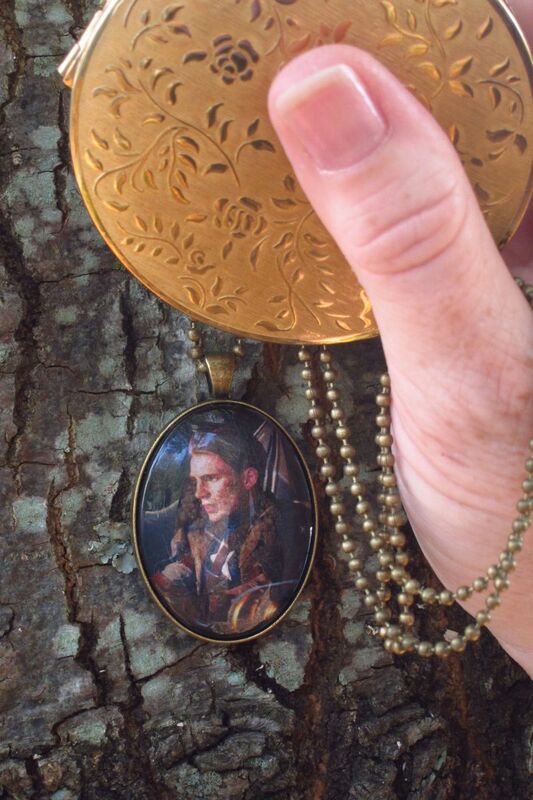 But the crowning glory of the package was the antiqued locket that my friend made for me–complete with a picture of Steve Rogers in it! I mean, seriously? How cool is that? So you see, I really HAVE to take my Peggy Carter costume with me to Galacticon/ComicPalooza, right? I thought so. In other news, I have an interview and excerpt from The Boys of Summer up at Chris T. Kat’s blog, please do drop by, check it out, and leave a comment. As a matter of fact, I have a bunch of interviews lined up, including some giveaways too. I’m going to be on The Armchair Reader, Savvy Author’s website, doing a Q&A on Love Romances Cafe’s site, and doing some other guest blogging in the weeks running up to Galacticon. I’m going to be hosting people here in the upcoming weeks as well! I’m also putting together swag bags for Galacticon, and will be holding a contest soon for swag and a copy of The Boys of Summer. I’m planning to upload The Boys of Summer to ARe and Createspace this weekend (barring more formatting issues), so hopefully those of you that have been holding out for a print copy won’t have to wait much longer. And believe it or not, I am writing. I’m working on two different projects with my good friend Claire Russett–we’re contemplating writing stories together for both of our sci-fi universes. I’m working on other stories as well, but having a hard time settling down to writing a particular one. Oh, I know, how about a poll? What would you like to see me working on next? What do you want Sarah Madison to work on next? This entry was posted in Uncategorized and tagged announcements, Battlestar Galactica, contests, Crying for the Moon, interviews, Peggy Carter, polls, promo, Sarah Madison, The Boys of Summer, Unspeakable Words by Sarah Madison. Bookmark the permalink. Erm, as a sewer, I’m trying to figure out how hemming a skirt could make the jacket to short. Unless you raised it from the waist? In any case, wear the outfit. Even if you have to leave part or the skirt unzipped or unbuttoned, you can always pin it in place so the jacket works. Just wondering, are you going to draw lines up your calves with eyeliner? That would be cool. Also, I skewed your vote by voting for more that one story. It was the least I could do since you only hid a missing scene from “Crying for the Moon”. HA! Found it anyhow. Keep up the awesome work. Ah, well, the problem was the skirt was too large as well as too long. The person hemming it for me cut it off at the bottom and did nothing about adjusting it at the waist–but when I tried it on with the jacket, it hung at my hips, leaving a big gap from the bottom of the jacket to the waistband of the skirt. (I’d initially thought the jacket was longer–otherwise I would have had the skirt professionally altered–I wish I had, but I was on a time crunch for Halloween). So my choices were to pull the skirt up and have it be way too short, or leave it at my hips and try to fashion a cummerbund with the leftover material. Neither one looks that great. Hence trying to find a new skirt on another time crunch! You wouldn’t believe how hard it is to match ‘drab olive green’!! Hey, I made it so people could vote for more than one option–I could have left it one only, but I was curious to see what people would vote for. 🙂 But I don’t know what you mean about a missing scene…? Sarah Madison recently posted..Coming Soon From Sarah Madison! Argh! Now I’m going to have to find the link to it again. It was in an interview or excerpt of the story I read on another site. I did copy/paste it to my own computer. “I Don’t Do Halloween” is the excerpt I was thinking of. I found it following links. It’s not in my Dreamspinner copy of “Crying For the Moon”, so I thought it was an excerpt. Also, now I get the skirt issue. I made that mistake once. I ruined a vintage one-of-a-kind skirt, doing that. God, I cried, and am still pissed over that. My petite and slim sister-in-law still thanks me for my mistake, years later. No matter what you decide, the shoes must be worn. They’re awesome. I’m still mulling over your Dreamwidth post on fandom. It reminded me of your blog post here about cyber-bullying. It made me realize another part of me has avoided, not just being very active in fandom, but why leaving positive reviews on stories I enjoy, or have complicated reactions to, scares me. Fandom can be rewarding, or vicious, and how that scares me. It’s hard enough in real life to avoid landmines, much less in a virtual world, where there are no clues about people except what they write. As for leaving reviews, well, that’s a tough one. In fandom, people are predisposed to like your stories because they already love the characters–so that’s a big built-in factor right there. Then too, part of the great fun of fandom is to squee with your friends over stories, pictures, art, anything and everything to do with your show! So people tend to leave more comments on fanfic than they do for original fiction. In fact, until fairly recently, readers leaving reviews for original fiction wasn’t really an option. Reviews were the purview of professional reviewers–and readers could only support a story with sales. I think readers are still slow to leave reviews on stories they liked simply because it is not something the average person–outside of fandom–thinks about much. I really appreciate your kind words for TBOS. This story was so important to me on a personal level, and it makes me very happy to know that you enjoyed it.